- Remove the outer sheath of the nail and file/sharpen the nail. - Release scents (pheromones) on to objects to mark them. - Create scratch marks and thus a visual marker for other cats to see. - spray your cat with water every time he/she scratches the wrong place and make sure to reward your cat every time he/she scratches the correct place. 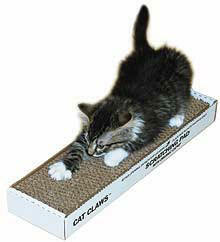 cover covering your cat's favorite scratching places with double-sided tape. Another procedure that is an alternative to declawing is a tendonectomy. During this procedure the tendons that connect to the cat's claws are cut. Thus the cat can no longer extend his claws to scratch (the claws remain in the retracted position). Although this can seem like a minor surgery compared to declawing the owner does need to clip the cat's claws frequently. Since the cat can't extend his claws he also can not scratch to take care of them. Without clipping your cat's claws they will continue to grow back into the paw. Due to the maintenance factor most owners choose declawing over tendonectomy. However this can be a kinder alternative to declawing if you are willing to put in some time.